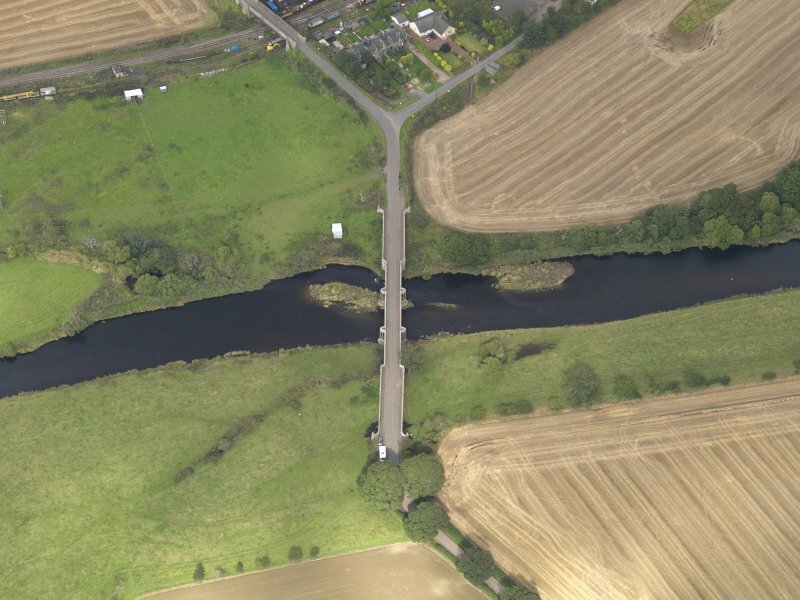 Oblique aerial view of Bridge of Dun, taken from the S.
Oblique aerial view of Bridge of Dun, taken from the WNW. Location formerly entered as NO 662 584 and NO 66272 58424. Architect: Alexander Stevens, built 1785-7. (Location cited as NO 663 584). 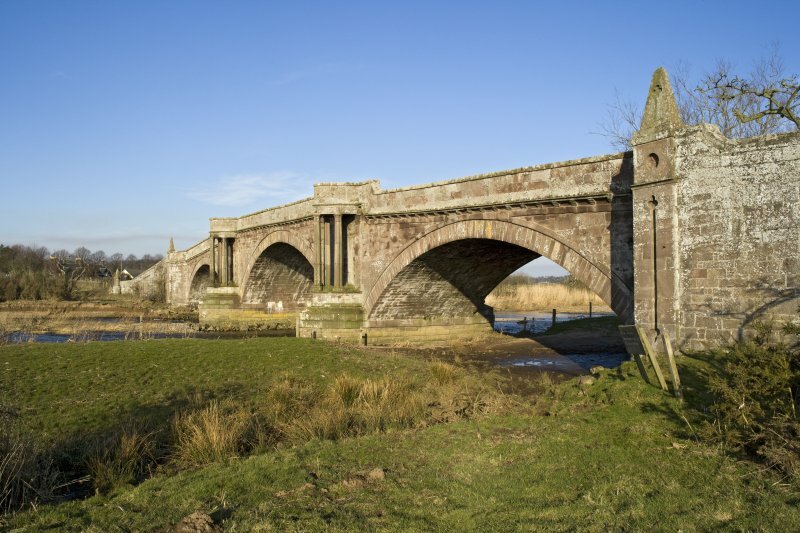 Bridge of Dun, built 1785-7, architect Alexander Steven. 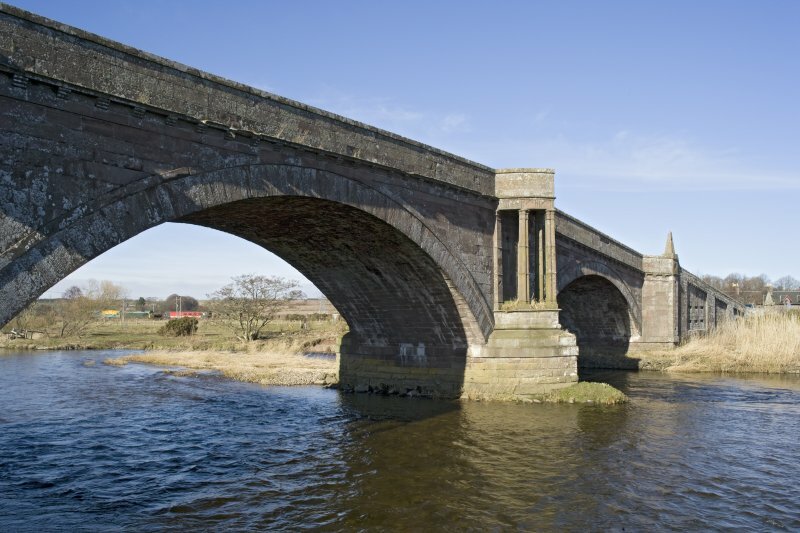 A remarkable three-span bridge of dressed-stone construction with coursed-rubble alignments. The arches are segmental and there is a dentilated cornice. There are pointed cutwaters, supporting groups of four columns which in turn support semicircular pedestrian refuges. 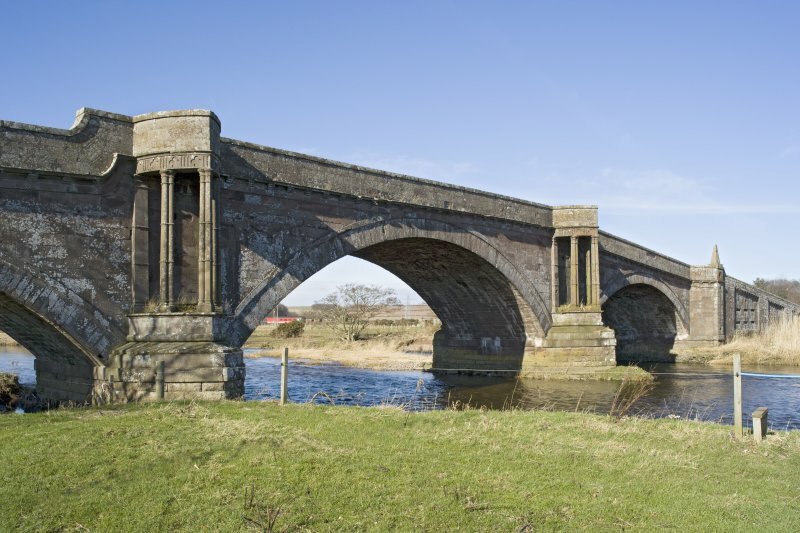 This bridge carries an unclassified public road across the River South Esk near the W end of Montrose Basin and to the SW of Bridge of Dun village. Although the entire structure falls within Dun parish, the boundary of Maryton parish is adjacent to the SE. Information from RCAHMS (RJCM), 19 April 2006. It was designed and built by Stevens whose use of classical ornamentation transformed the bridge from being a purely utilitarian structure. The contract price was £3128. 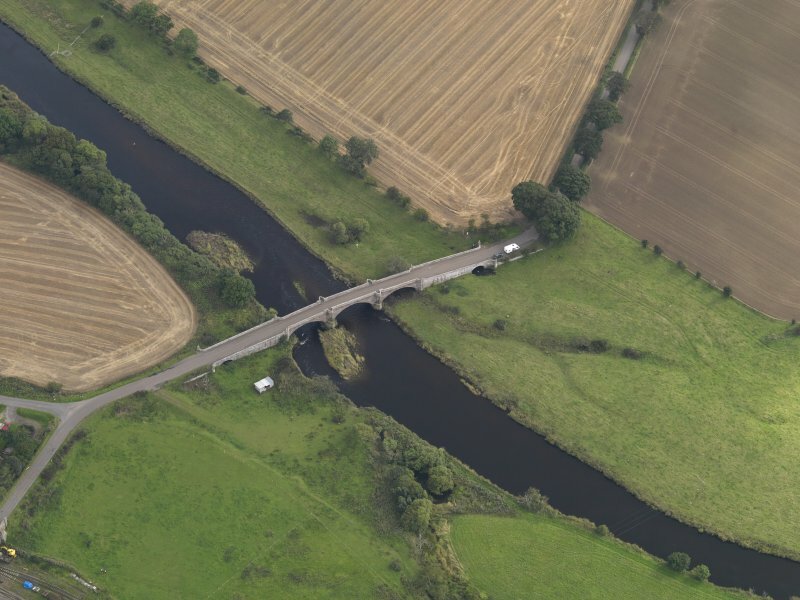 Photographic survey of Bridge of Dun, Angus, by the Ministry of Works in March 1965. 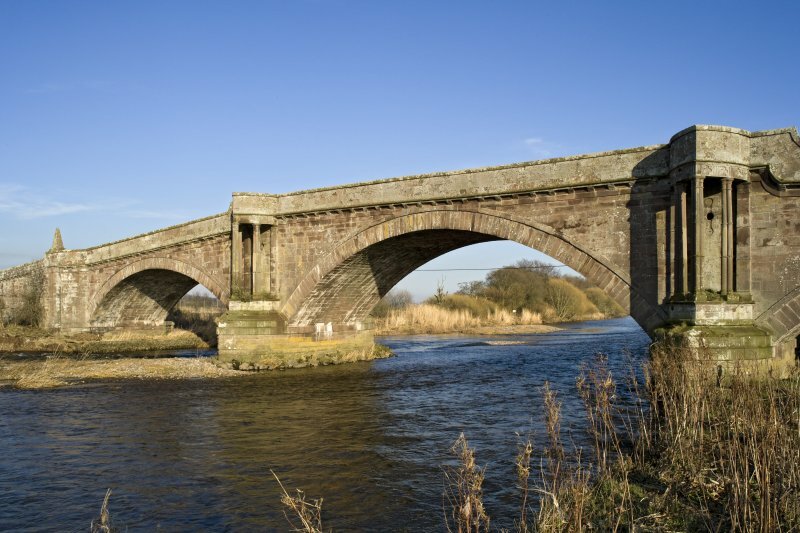 Bridge of Dun was founded on 7 June 1785 and completed on 27 January 1787. It is an elegant Gothic design worthy of a major road, the policies of a large house, or an urban setting, and its location on a minor road of no importance is diffIcult to comprehend. 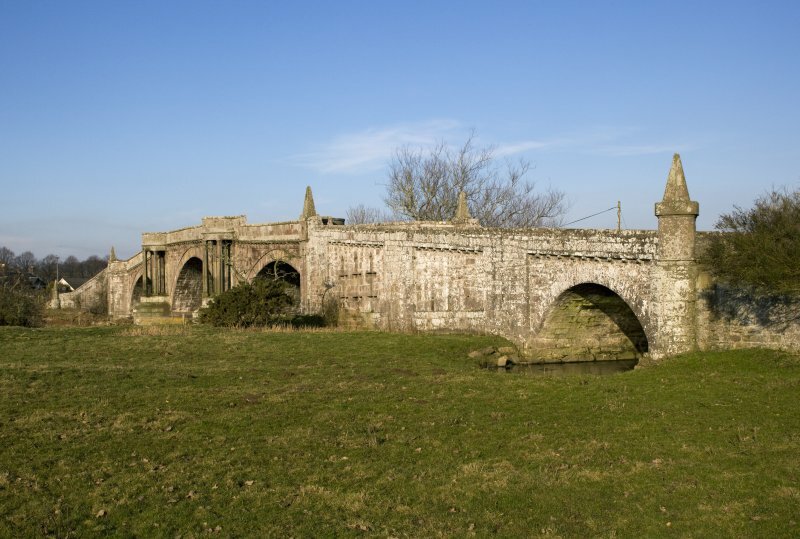 It is a stone bridge of three arches with unusual columned supports to refuges over the cut-waters on either side of the main span. The parapets are detailed with castellated features. 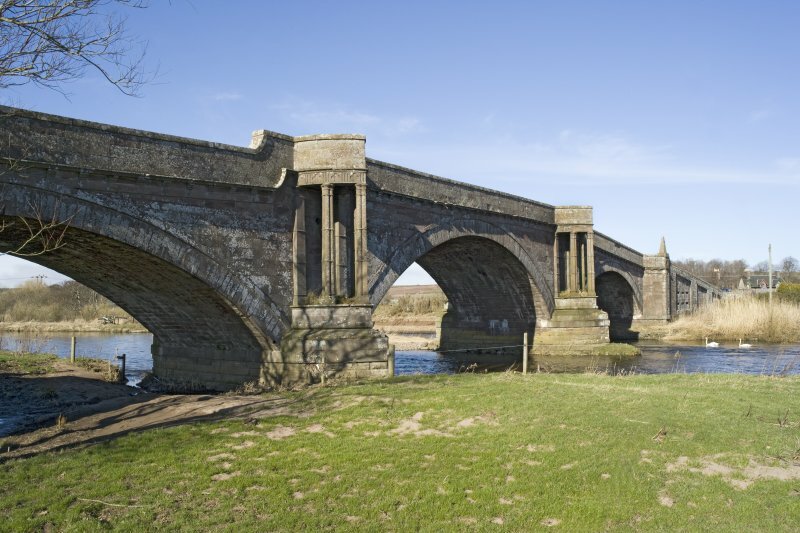 The Bridge of Dun spans the South Esk at the west end of the Montrose Basin and was erected from June 1785 to January 1787. It was designed and built by Stevens whose use of classical ornamentation transformed the bridge from being a purely utilitarian structure. The contract price was £3128. 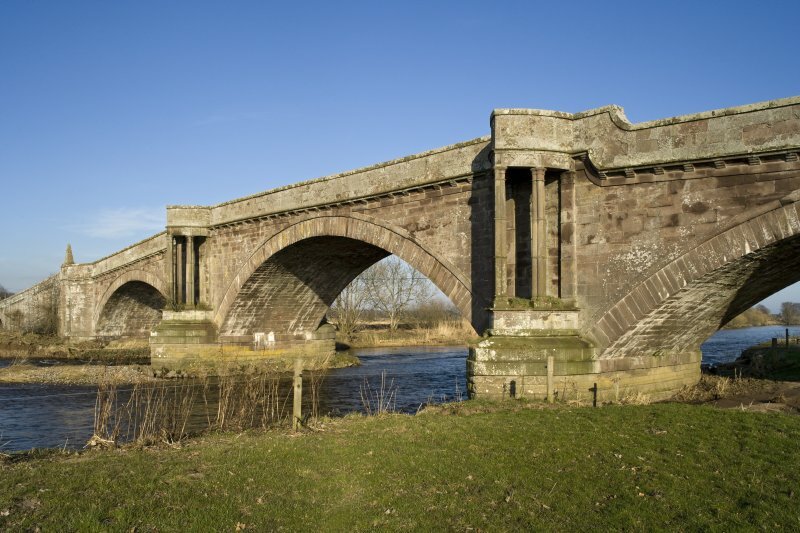 The bridge is symmetrical with three segmental arches, the centre span being 68 ft and the side spans 50 ft. At both ends of the bridge the roadway rises steeply from lowlying ground on embankments enclosed between masonry walls that are pierced by 20 ft span flood relief arches. 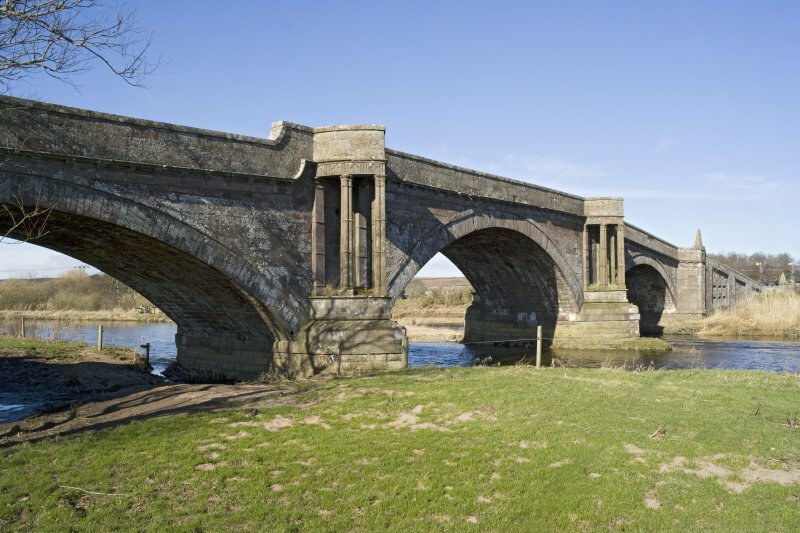 The piers are carried on piled foundations, and the masonry above the bases of the abutments and piers was built solid across the structure to a height of 4 ft, above which the road, 18 ft wide, is carried on pends (arched or slabbed longitudinal cavities) along the length of the bridge. 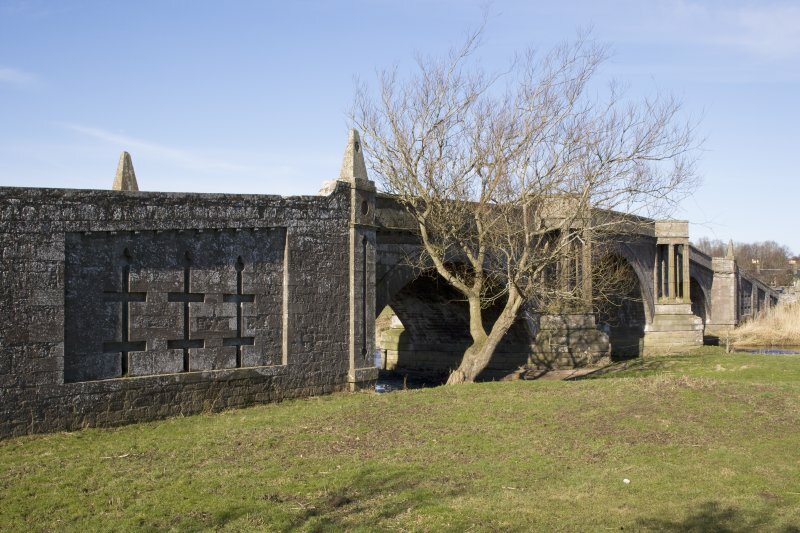 Theexternal masonry, the refuges above the piers and the approaches are constructed in dressed ashlar with decorative features. Photographed on behalf of the Buildings of Scotland publlcations. 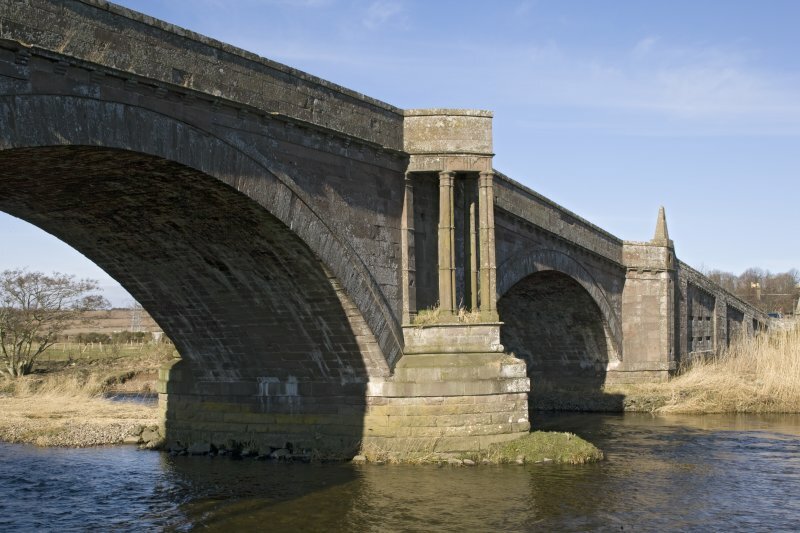 Built in 1785-6 by Alexander Stevens, shortly before he built a timber bridge at Montrose that made this bridge seem even more of an extravagance given the superb quality of the ashlar and profusion of gothick detailing. Three arches meet at two cutwaters that extend upwards to refuges on slim clustered columns. The railway station where starts the route to Brechin comprises a station house (private property not part of the Caledonian Railway) extensive rolling stock and a timber goods shed transferred fron Nairn, now used to store diesel locos.